Have plans to visit the Minnesota State Fair? Be sure to stop by the College's booth in the Education Building on Cosgrove Street for unique St. Scholastica-themed fair goodies and connect with actual students, staff and faculty. This year, St. Scholastica features multiple booth attractions, such as our crafty button-making station, where you can make your own St. Scholastica fair button. Write a message to your favorite Saint using the #SaintsSay cards, or pick up a "Saints on a stick" fan to cool off. Be sure to tweet or snap a pic of your #SaintsSay using the hashtag for a chance to be featured on the official St. Scholastica Twitter, Instagram or Facebook page. 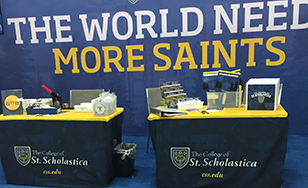 Or, you can tag us in your picture at the St. Scholastica Booth using #SaintsonaStick.